Chances are, as you’ve entered the inbound marketing sphere, you’ve heard more and more about search engine optimization (SEO), blogging, and social media as important tools for the inbound methodology. But, did you know that these tools should be used together to gain the best results? To begin combining your efforts, take time to evaluate your strengths and weakness in each individual area. Using this knowledge, begin constructing goals for growth in each area. As you’re building out your campaign, it will be important to revisit goals frequently to ensure that you are making the most of your compounded efforts. Typically, you will want to begin with SEO efforts, assembling a list of key words for your campaign. Using Google’s keyword planning tool, create “ideas” based on 5 -10 relevant terms for your campaign. To take it up a notch, evaluate key terms used by competitors by including their URL in the keyword planning tool. Once you’ve created a master list, export your data to find important info such as local monthly search volume and competition for each of the terms. From this list, aim for relevant long-tail terms with a competition of less than .5. Depending on your campaign, the search volume may or may not have an impact on your term choices. Use the narrowed list to delegate terms into an editorial calendar for your blog posts. Basing off of relevant key terms will help to create more targeted campaigns with optimization research to back the posts. Following the keyword or phrase previously designated, begin crafting your blog post to fit the topic at hand. Rather than using the keyword in your body copy over and over, as was the practice of yester-year, write your posts to be as natural as possible. As Google has evolved, it has discouraged keyword stuffing as a method for appearing on search engines more each year. After you’ve used your exact key term 1-2 times, use natural alternatives in other areas of your post. For example, if the key term was, “Social Media Marketing,” you may use this in the title and URL, but use terms like, “Social Media Tools,” “Marketing on Twitter,” and “Social Platforms for Marketing” throughout the body copy. Remember, Google has begun penalizing heavily for keyword targeting, so don’t go overboard or push anything through if it is not natural. Plus, your viewers want content that is informative and easy to read. They're going to stop reading your content if it is keyword-heavy and unnatural sounding. Your campaign is not complete without some help from social media. It is always a good idea to include social share buttons on your blog pages. This gives viewers an easy way to share your awesome posts, and provides you with a fantastic tool to measure post popularity. 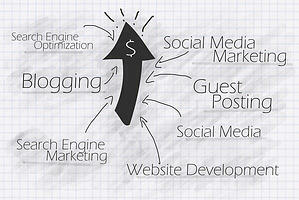 As you continue to post to your blog, you will be able to use shares as an important data point. You will be able to discover which types of posts resonate best with your viewers and what kind of content they like to share with their friends. This information will help in future editorial calendar planning. On top of measuring viewer shares, you also need to proactively share blog posts on your social media platforms as well. This gives your social media followers a stronger chance of moving onto your site where they will find a bounty of useful information. As this cycle grows, they will be likely to share your posts, and may even find more info to share from content on your site. Encourage conversation around your posts, and participate by responding. Not only will shares help grow your presence on your social media platforms, but as more and more people are tweeting and sharing links back to your site, the more “links” you are building as well. A very important part of SEO is link building. Chances are, the more links you have going to your site, the better your page authority will become – increasing your odds of being higher up in search engine results. Notice that some of these numbers are lower or higher than you wish? Don’t be afraid to go back to the drawing board. Not every post will be a winner, but there are adjustments that could be made to make your posts more effective. Do you have a lot of bounces? Try re-writing social media posts so they better describe what a viewer will find if they click on the link. Not so many views? Try sharing your post on a different social media platform; your Twitter followers may not be as interested as your Pinterest followers would be. See how it all draws together? Combine your tools into one so that you have a swiss army knife instead of a bulky tool belt! SEO, blogging and social media should be utilized together so that they mesh and help boost one another for one amazing campaign.